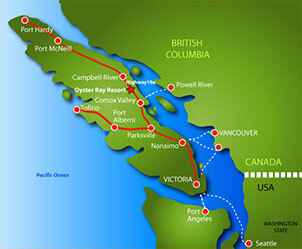 Visitors will be amazed at all the attractions Campbell River/Comox area has to offer. Explore the Strathcona Provincial Park, Mount Washington, Discovery Islands, restful beaches, luxuriant forests and crystal clear lakes. The diverse alpine-to-ocean landscape and year-round moderate climate furnishes an exceptional diversity of outdoor adventures......hiking, fishing, kayaking, skiing, boating, swimming, world class golfing, diving to name a few. This is a place where you can mountain ski in the morning, golf in the afternoon and catch the evening tide for saltwater fishing. Book your chalet today and enjoy PEACE, BEAUTY and NATURE!